Vote for Homecoming king and queen, student senators, and UTA Ambassadors until 6 p.m. today, Tuesday, Oct. 24, in the University Center Gallery. Bring a photo ID, preferably your UTA student ID. LEARN MORE. 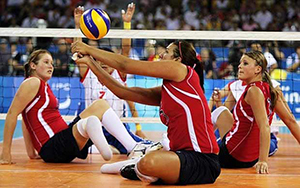 Learn about sit volleyball, part of UTA’s Adapted Athletics Sport Club, at an open gym night 6-8 p.m. Wednesday, Oct. 25, on court #3 at the Maverick Activities Center. Bring your friends, form a team, and practice for the end-of-season tournament Wednesday, Nov. 1. Enjoy a night of entertainment and friendly competition. For more information, email courtney.cantu@mavs.uta.edu. 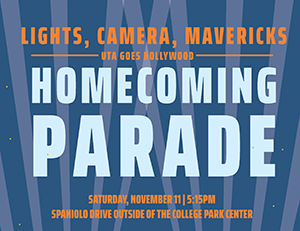 Your student group is encouraged to enter a float, golf cart, or walking entry in the UTA Goes Hollywood Homecoming Parade. Prizes of $250 and $100 will be awarded to the first and second place entries in the departmental and student organization categories. Register by Tuesday, Oct. 31. Go to uta.edu/homecoming for entry form, rules, and regulations. New Maverick Orientation is now accepting applications for the 2018 Maverick Orientation leader teams. Applicants for both freshman and transfer orientation leader positions must have a minimum GPA of 2.5, be a full-time undergraduate student, and be in good standing with the University. Apply online by Wednesday, Nov. 3. Secure Shell (SSH) and SSH Secure File Transfer (FTP) will no longer be available starting Friday, Oct. 27. Faculty, staff, and students with a Windows operating system should use PuTTY and FileZilla to access web publishing on students.uta.edu sites and on Omega, Gamma, and SQL servers. Mac users will continue to use the built-in software Terminal for FTP processes. For more information, read How to use PuTTY to connect to Omega and Gamma servers and How to download and connect FileZilla to Omega Server articles. If you have any questions, comments, or concerns, contact the IT Help Desk at 817-272-2208 or helpdesk@uta.edu. Homecoming 5K—Register by Nov. 11. Event is Nov. 11. Student representative of UT System Board of Regents or Texas Higher Education Coordinating Board—Register by Nov. 11. Arlington Martin Luther King Jr. "Advancing the Dream" Celebration—Scholarship essay contest deadline is Nov. 28. Nov. 1—Last day to drop classes; submit requests to adviser prior to 4 p.m.